Whatever doesn’t deafen you makes you stronger: Grantland’s Jay Caspian Kang, Mark Lisanti, and Emily Yoshida have returned, bowed but not broken, to tackle another season of American Idol. This week: Has the enchantment of an unexpectedly strong season finally worn off? Lisanti: I’m still on board. There’s some real talent on the girls side (Angie, Aubrey, Amber, Candice, Kree, Janelle, and Breanna), then there’s Curtis, Devin, Burnell, and Nick Boddington, if Boddington doesn’t (1) drop out in two weeks to front a Goo Goo Dolls world tour or (2) isn’t fatally socked in the breadbasket by Aubrey after she’s prematurely tweened back into a consolation record deal and side-career as a model. I can deal with the Zoanettes (still fun to watch, sort of) and the Charlies for another week or so. Also, I just won $38 dollars in our “How long until a once-enthusiastic Kang says he wants out/threatens to stab himself in the garbage with an ice pick?” pool. I had the “Charlie Askew wears a tank top and ponytail” box. Pretty big day for me. This is nightmare territory, one of those times where you’re watching someone be destroyed by a television show in real time, and it was almost unwatchably painful, but that didn’t stop me from going back and rewatching it three times. Everything Nicki says is true, and if it sounds like she’s harping on superficial points it’s only because she knows that they are indicators of Charlie losing himself in the competition. Then, when she’s done speaking to him as a truly disappointed supporter (I KNOW THE FEELING, NICKI) the Dawg just uses his time to laugh at Charlie like a freak. Randy, shut up. ARE YOU HAPPY NOW, JAY? AMERICA?? You made Charlie cry. Thoughts on Angela “Angie” Miller? Is she really the favorite to win? Kang: She’s got a big voice and she can shimmer and she convincingly plays the piano, but I don’t see where all that gets us because every time she sings it sounds like the song they would play in the flying scene for The NeverEnding Story IV. Which is really too bad because she really is talented and seems like she’s probably not mean to the other theater girls in Beverly, but what’s she going to do when America gets tired of the whole Pageant Superstar act and wants her to plant her feet on the stage, squat, and squeeze out a credible “Time After Time”? Also, having just spent a night in Beverly, Massachusetts, I’m pretty sure Angela (who is now Angie for some reason) will most likely shorten it one more time to Ang. People from the North Shore of Boston seem to be crazy in that way — they take perfectly nice girls’ names like Elizabeth and change it to things like Z.B., Lizzay, or Welkaaaah. Yoshida: That was a Colton Dixon song!? When she said that, I’ll admit it took me about five minutes to remember where I knew that name from. I had thought it was an original, because when I see a girl at a piano all I can think about is what a unique and genuine creative soul she is. Angie and Nick Boddington are quickly learning that a piano can be your best friend if you have nice arms and questionable artistic identity. It’s like being behind the wheel of a musical monster truck; it crushes everything in your path, and nobody can tell how “good” you are at driving it on television. But yeah, not a bad song! Good job, Colton! You look like a Christian Cloud Strife now! Get at this guy, Akron! Are Angela and Colton buds? Are they in like? Wasn’t Colton married when he was like 12? Lisanti: Should I post the Vegas odds right here? I should, right? These were set before this week’s shows, but I still wouldn’t argue with that top four. And the bottom of the list also looks correct to me. The middle’s problematic; I’d probably have Candice and Nick higher, and put Lazaro and Paul in a small rowboat and set them adrift in the Arctic Ocean with nothing but one small blanket and a set of silverware. But back to Angie: She made a Colton Dixon song sound great! I hope she covers Daughtry next week. She can do anything as long as she’s in contact with her magic piano. Is anyone peaking too early? Kang: This is Kang Rule no. 53. “I Believe I Can Fly” might save you from elimination, but it’s not a good way to build momentum. Every time you’ve got a gospel choir on stage and you’re writhing around and singing those ridiculous lyrics, you’re going to look a little desperate. If Curtis Finch Jr. wants to be known as more than the other Jacob Lusk, he needs to stop singing the songs that fat gospel singers all sing when they go on Idol. 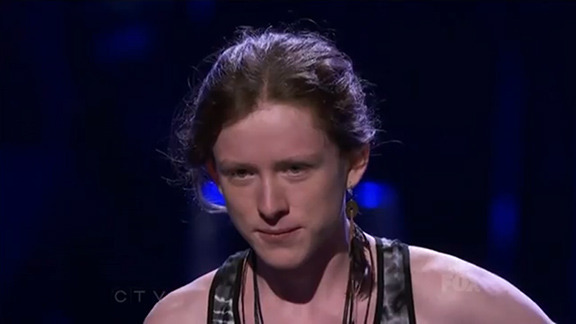 I think he’s gone in a shocking elimination this week. Yoshida: It’s gotten to the point where I don’t even watch a performance of “I Believe I Can Fly” anymore. Seriously, I spent Curtis’s performance in the kitchen cleaning the greasy leakage from the Palms Thai delivery bag off my counters. If someone does actually bust out an amazing version of this song, I trust someone will tell me about it on Twitter; otherwise, I got stuff to do. Can I troll for just a bit here and say that I think Candice Glover might not have very many directions left to go? I hope I’m wrong about this, but I don’t know how interesting I’m going to find her in three weeks. I dunno, it was fine. Maybe he cleared up somebody’s glaucoma. Kang: So, to rephrase the question: Is anyone coasting along right now and getting a lot of love from the Dawg Pound and isn’t bringing too much attention to himself or herself but still has the reserves of energy to peak later down the line? And, more importantly, will the tweens love him or her? I honestly have no idea who that person might be. I might say Aubrey, but isn’t she too attractive and threatening? Kree Harrison is a bit too earnest with the whole, “Hey, I’m an artist and I’ve worked so hard and I’m showing my heart to you” thing, which has never worked for anyone since Carrie Underwood. Yoshida: Janelle might have it locked up. Her whole “I’m not changing my small town persona” bit was predictable, but only because it’s the smart thing to do when you’ve been getting mixed critiques and aren’t a sure bet for the top 10. She’s more relatable than Aubrey or Angela, and by now we all know how those country fans vote. Though, it will be interesting to see if this new “super vote” app (which allows you to cast 50 votes with one click) changes the outcome. There is definitely a kind of American Idol viewer who is more willing to sit and text for an hour straight after the show than others, but if it takes less energy to vote just as much, maybe less classically obsessed viewers (i.e., non-tweens) might be able to have their votes count a little more. Anyway: How about Devin? He has the best voice of the guys, could eventually galvanize the tween bloc with his non-threatening, let-me-hold-your-hand-at-the-arcade vibe, and the judges are in super-lurve with him. He could sneak through to the finals if he’s ever photographed near a guitar. Or a DDR machine. Mariah’s been excruciatingly bad, even in fast-forward. Every lede is buried in her critiques and when she finally gets there, you realize that she really has nothing to say, except, “I would have done it better,” which is 100 percent true but just kind of obvious. I am also angry that she seems too dignified to sing along à la Jennifer Lopez or that god-awful succubus Kara DioGuardi. Yoshida: I’m more concerned about what happened to Nicki – as soon as the lights went up on Tuesday it was clear not all was well with the Ladybug Wrangler. I couldn’t help but wonder if some producer had told her, “Hey, do you think you could maybe dial back a little bit of the on-point wackiness that people have come to know and love you for? The recappers at Grantland are starting to like this show, and we’re afraid that will upset the natural balance of the world.” She was mostly back in form by the guys’ night, but I’m still worried about live TV stealing her sparkle. Still, we’ll always have this. Lisanti: Listen: When you sign up for the Mariah Carey experience, you are signing up for a certain level of regal detachment. Every minute she’s next to Randy behind that table is a minute she’s not soaking in a tub full of Cristal, listening to “Vision of Love” on an endless loop, and occasionally ringing the tiny porcelain bell that summons Nick Cannon with a sterling silver platter of edible diamonds. Mariah ain’t singing along to your terrible rendition of Adele. She’s got diamonds to eat. Jay Caspian Kang will find his thrill again next week. Emily Yoshida has beaten Final Fantasy VII 829 times. Mark Lisanti is a little offended by that Kara DioGuardi comment.